Tommy Bahama has a reputation for making quality clothing that is both lightweight, comfortable, and fun. Our Spring Collection from Tommy Bahama holds true to this with many of their products featuring new lightweight fabrics, fun designs, and the level of comfort that has made them famous. The new Striped Emfielder Polo combines comfortable Pima Cotton with classic detailing to form a must have for your spring/summer wardrobe. The new "Dune Drifter" polo is made from a Modal and Polyester fabric that gives it a very plush and silky feel and it is available in a multitude of colors. Tommy Bahama has also featured a couple of short sleeve camp shirts made from a seersucker fabric. Seersucker by nature is very breathable due to the unique way it is woven. The "Hu-la-la" and the " Santorini" shirts feature designs worthy of their names, Hula girls and detailing from the Greek Island Santorini. Pictured along aside them is "Sunset Lounging" silk shirt which features a design that covers the entirety of the back. 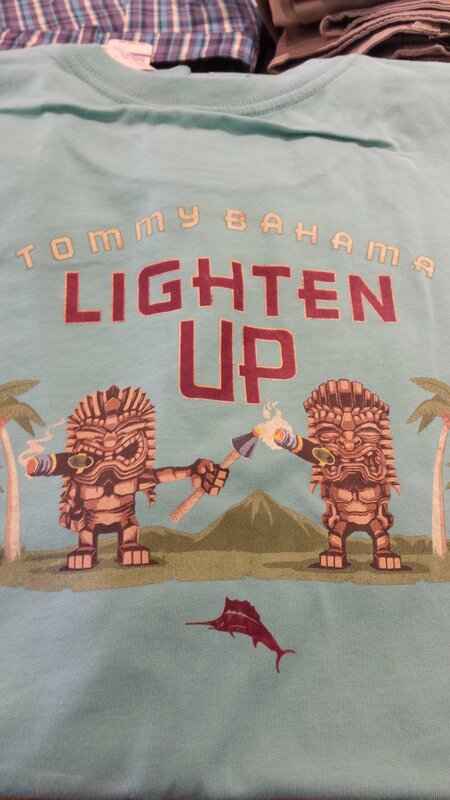 We have these and many other great products from Tommy Bahama, be sure to stop in and check them out! Newer PostTreat's Squire Shop 2017 Summer Sidewalk Sale July 13th, 14th, and 15th! Older PostNew St. Croix Spring Collection!